If you're interested in buying any of the clocks featured here, please contact me. While I am happy to post clocks to you, I personally believe it is always better to see them 'in the flesh' before buying and then you can take them with you, avoiding the potential for damage! 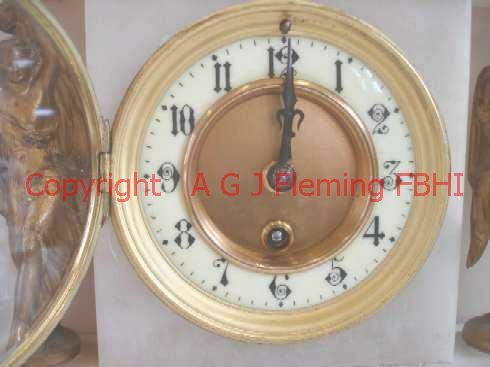 If you do not see what you want here please ask, as I have a selection of clocks still awaiting restoration - one of which might be just what you are looking for! 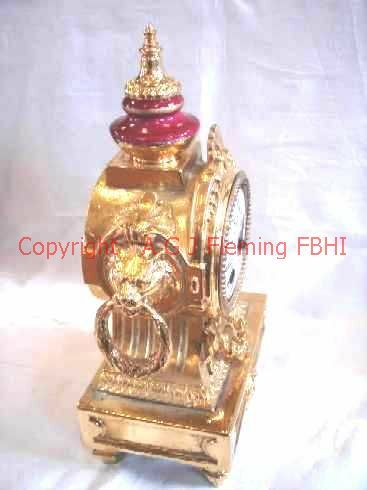 All clocks I sell have been fully overhauled by me personally and are fully guaranteed for one year. 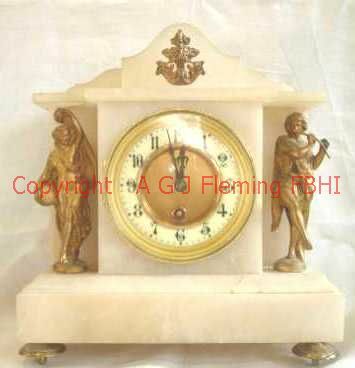 This is a particularly nice example, and is alabaster not white marble. 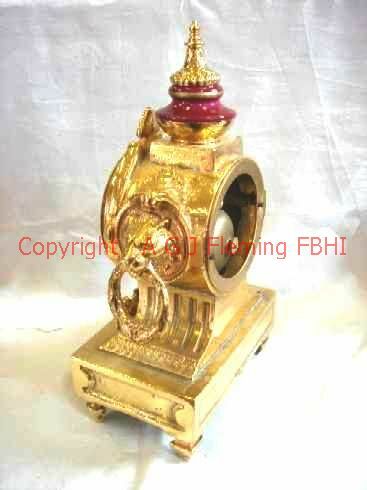 As you will see, the case is surmounted by a 'dish' with a gilt metal rim & 'handles' - though it can not be removed! 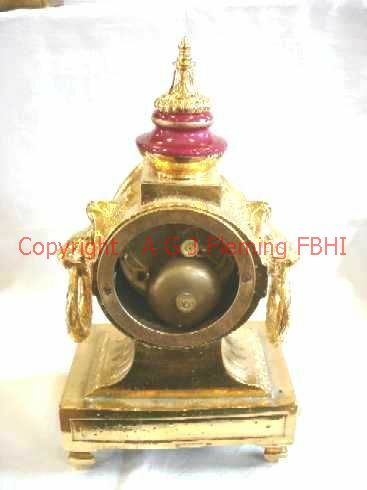 The movement has a half-hour count-plate strike (on a bell) and a Brocot regulator on the suspension, the back plate has the Japy Freres Gde Med D' Honneur round stamp (used from 1855 to 1873) and the numbers on the pendulum match those on the movement. The case is in good original condition with very few scratches to the alabaster, though the bottom right corner shows some damage. 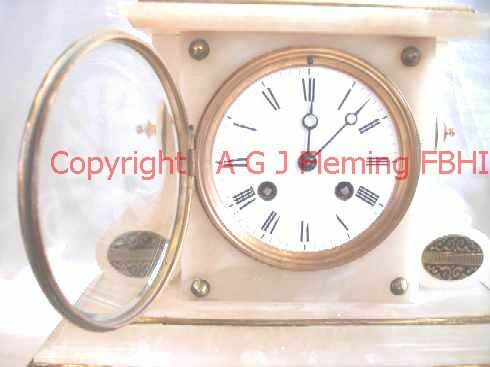 In addition to this the dial has a hairline crack from 1.00 down to 7.00 and some chipping round the winding holes. Buy this now - phone 01451 810187 with your card details! 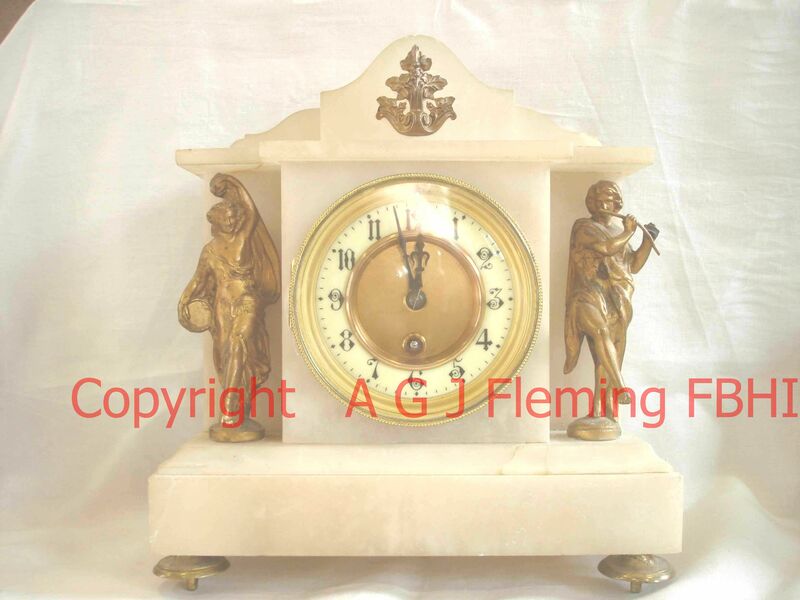 The case of this clock is reminiscent of the Russian 'onion-dome' roofs of the orthodox churches. 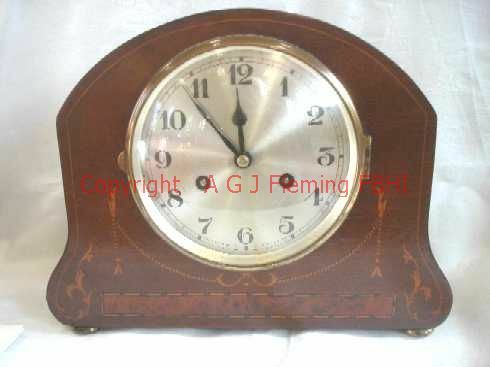 It is Edwardian, with Burr walnut inlay and (probably) boxwood stringing. The movement has a half-hour rack strike (on a bell) and a Brocot regulator on the suspension, the back plate has the Japy Freres Gde Med D' Honneur round stamp (used from 1855 to 1873).The back plate is also stamped B.R / 129 / 39209 between L pillar holes, and has the pendulum length number of 46 at the bottom. The case is in good original condition with a few scratches/bruises commensurate with its age. 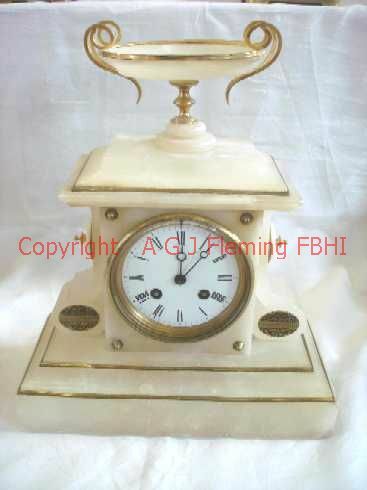 This clock is a timepiece, with Brocot regulation, unsigned & with only the pendulum length number on the back plate. 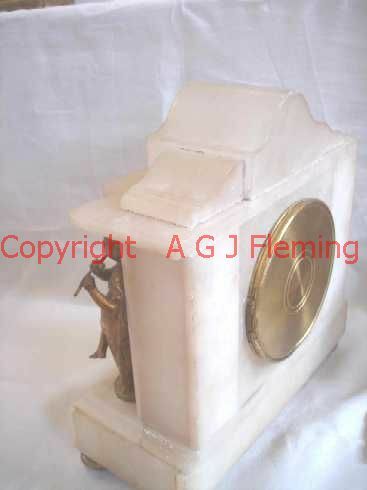 It is in an alabaster case with nymphs playing musical instruments in recesses either side of the trunk. 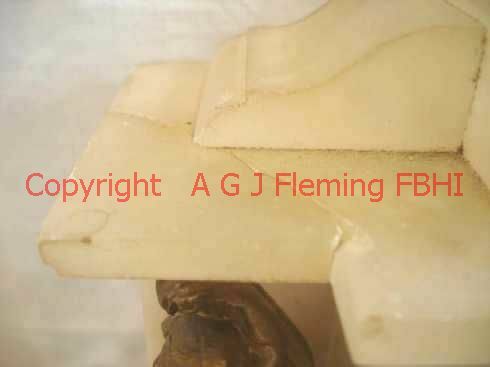 The case has been in the wars, with both the front right corner of the top slab and the front left corner of the slab below the trunk having been damaged as well as both ends of the front slab of the base. 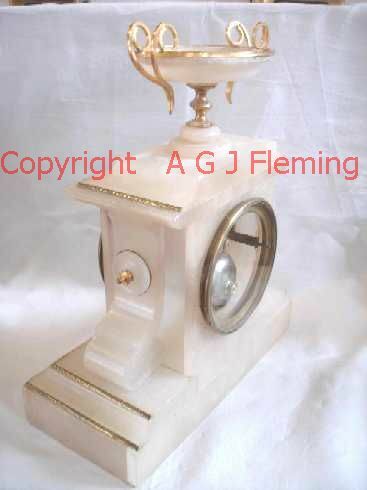 Also the pendulum is a modern replacement.I have tried to reflect this in the asking price. 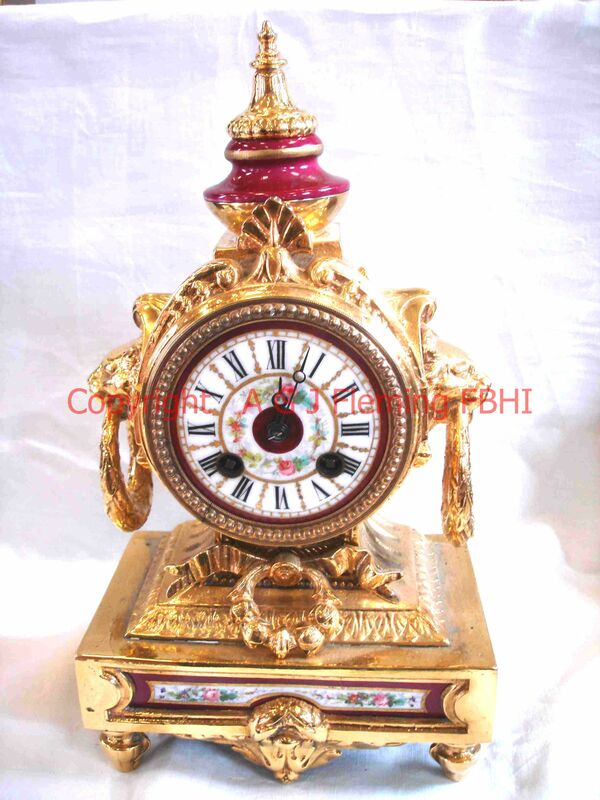 Despite this it is still an attractive clock and a good time-keeper. This is a standard French drum movement with a Brocot regulator on the suspension spring. It is a 1/2-hour rack strike on gong model, which is numbered but unsigned. The case is a 1930's 'Art Deco' ply one in good original condition. 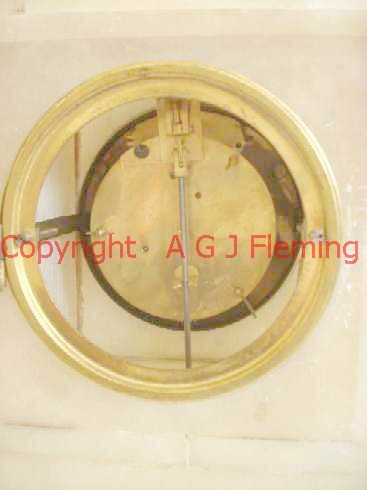 The inner part of the dial does have a small hole in it inside by the III, but is otherwise in good condition. 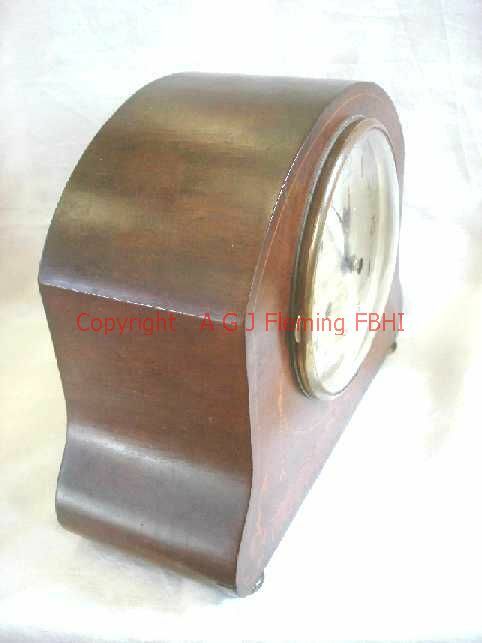 This clock is in a typical Edwardian case with (I think) ebony & boxwood "cord" inlay below the dial and round a burr-walnut panel below this, & boxwood stringing round the outer edge of the (dark birch?) ply case - a very pleasing combination. 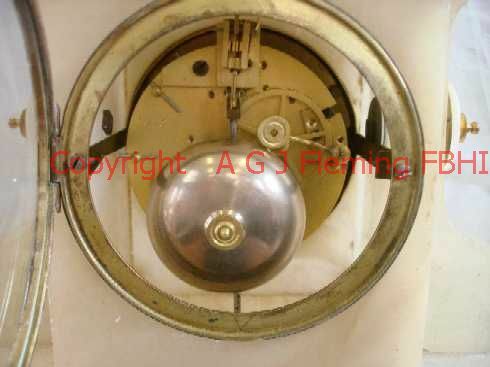 It has a good clear dial (silvered with the black-work applied on top), and the movement is a rack strike on gong one. 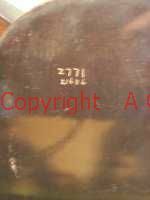 As you will see from the photos, the case is in very good condition (the last photo shows numbers a previous repairer has scratched into the inside of the door - the only obvious blemish to the finish). This clock is really quite impressive! 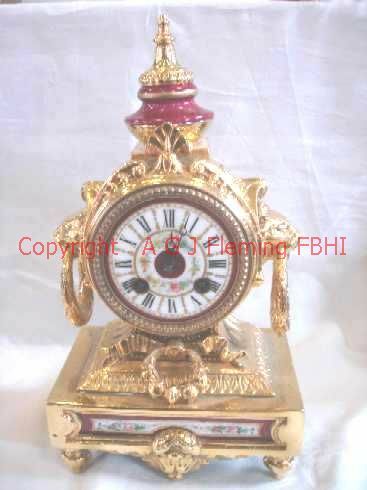 It is, as you will see, a fairly rococo-style case, with a ceramic dial, panel in the base and half of the urn on top. It has ben re-gilded and is bright as a new pin! 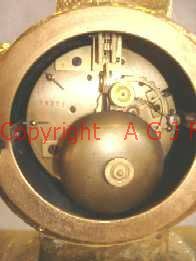 It has a count-plate 1/2-hour strike movement (striking on a bell) and the original pendulum with numbers matching those on the movement. 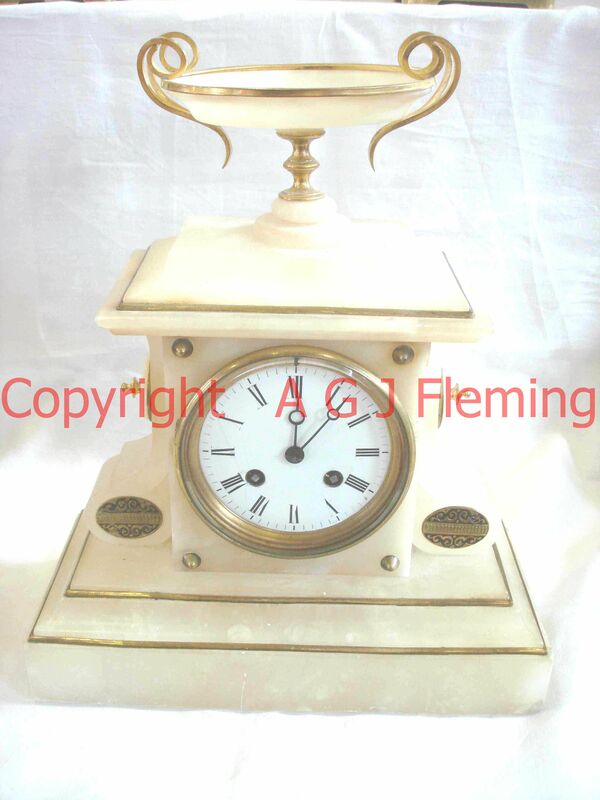 I am offering a (Jaeger) LeCoultre '8-Day' travel clock retailed by ASPREY, dual signed dial. This clock was bought for my mother as part of her 21st birthday present in 1945. As a result of much use over this time some of the leather covering of the folding case is wearing, but the movement is working well for the full 8-day winding period. The only other problem I know of is that some of the luminous material from the hands is missing. This is simply an amazing time machine - nothing more, nothing less! These are excellent quality movements by a very well-regarded maker and should give a lifetime of service if looked after. 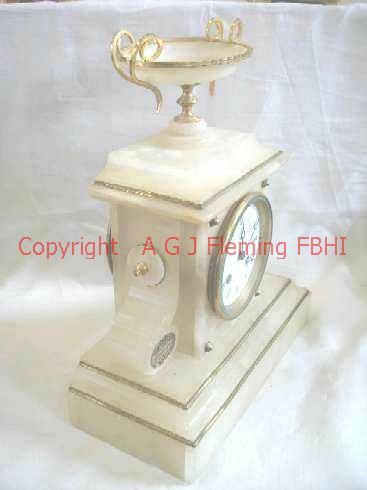 Items of quality do not come much better than this clock which sits well inside its self-contained shell housing....opening up to stand proud when in use. This is a nice simple piece with a good clear dial & nice colour to the wood. 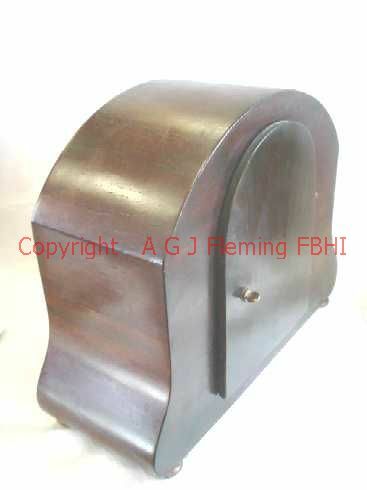 It has ebony & boxwood stringing round the front edge and a line of boxwood making a 'panel' below the dial. 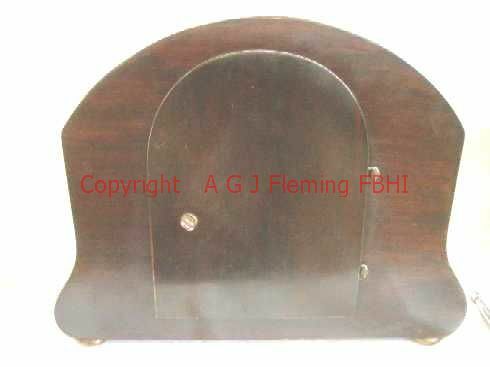 It is completely unsigned with the back plate only stamped with an arrow for the direction to turn the hands and 'MADE IN FRANCE'at bottom centre. It has a replacement platform, but it is a high quality one giving very good timekeeping. This clock is a timepiece, in a typical Edwardian inlaid fruitwood case. The movement is a standard French drum timepeice with a cylider platform escaspement. 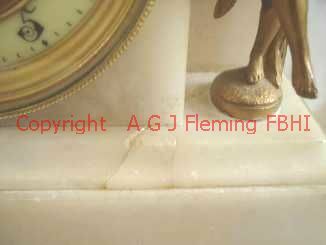 There is also slight damage to the left end of the moulding round the top of the front of the case. 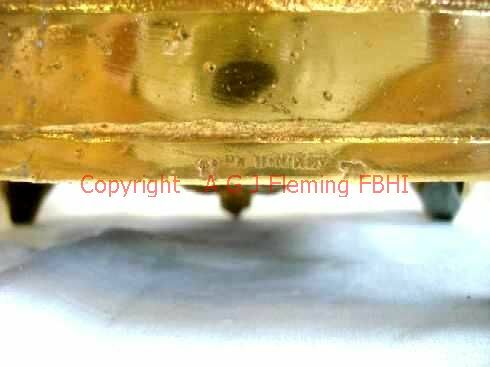 The back plate of the movement only has the word 'FRANCE stamped beside the ratchet click in addition to the arrow to show which way to turn the hands. 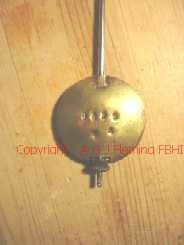 As you can see from the photos, it has a captive winding key and hand-set knob, so no keys to loose! In the back view you can see the round cover for the movement on the shelf beside the clock..
A very attractive clock and a good time-keeper.. 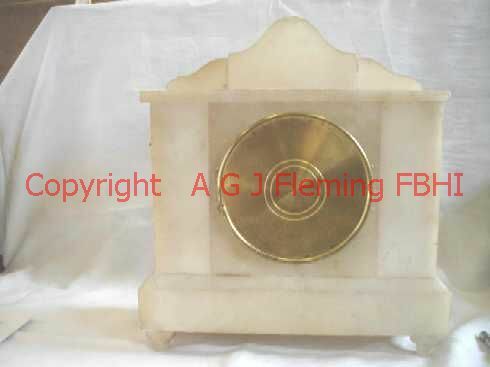 This clock in a pentangular wooden case is made by Smiths, with the casing ring stating "Smith's / English / Clocks / Ltd" on one side and "SEC / Cricklewood / London" on the other. The dial (also pentangular) is printed with '8 Day' and 'Made in England'. Due to the shape, the minute hand does not get anywhere near some of the numbers on the dial! It has a typical Smith's movement with an ABEC platform escapement, and a convex front glass. The widest part of the dial is 6.7", and the widest part of the minute tramline is 5.2", with the arabic hour numerals outside this. 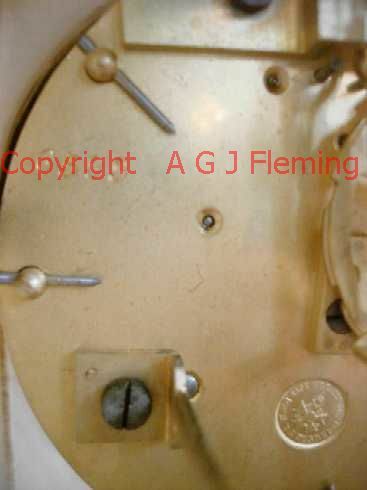 This is a typical 1960's travel alarm clock movement with a 7-jewel lever escapement. The two halves of the case slide open/closed, protecting the front when closed. It has separate winders and setting knobs for the time and alarm functions, and a push-button to silence the alarm. 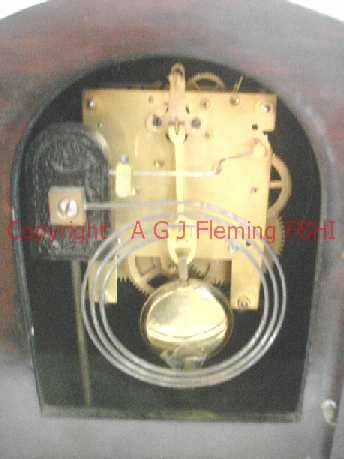 As you open the case two sprung-loaded feet pop out and the clock leans slightly backwards on these. Maximum dimensions: 6.5" wide(open) or 4.25" (closed) by 2.75" high, Aproximately 1.75" deep when open.